(thin .032 aluminum) with 4 hole punch, ideal for posting on surrounding trees. (thin .032 aluminum) with 4 hole punch, ideal for applying to a 4” x 4” post. Upkeep on your mining claim, to clearly mark out each corner of your site, to assist in deterring the inexperienced miners from accidentally staking over your claim. 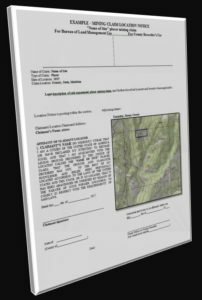 Do you have an existing mining claim or mining property in Idaho that you would like to sell? We might be able to assist you in making that happen. We will need to thoroughly investigate and review the details of your mining claim internally, before making that determination. We cannot always promise that we will be able to accept the liability to list your claims. We pride ourselves on the reputation we have built with our clients, ensuring that claims are to the legal, professional and ethical standards that we hold to. Idaho Gold Mining charges can range between 5% to 15% (excluding transfer fees)…or 3% for patented claims (excluding closing costs). I’m not sure if I need to mention this, but with the name “Idaho” Gold Mining, yeah, we primarily only list mining claims which are located in Idaho. Have you been out rock-hounding or prospecting, scratching in the dirt and find a treasure that you don’t want to pass up? Would you like to own an unpatented mining claim over that special site, but you don’t know where to start? or perhaps you just lack the time and resources to research the site/area yourself. Idaho Gold Mining specializes in helping fellow prospectors and miners file for placer mining claims, with the reassurance through our agreement that it will be handled in confidence and completed in a timely and professional manner. With our process; we will map out existing mining claims of the area, check to make sure the land is open to mineral entry, we provide, topo and aerial maps, gps coordinates, legal descriptions (written in accordance to the federal mining regulations) and provide location notices for the client, so that they can secure the mining claim directly (as well as instructions on where to record and file the location notice). It will be the client’s responsibility to ensure that the area where the mining claims are being acquired holds the locatable minerals that they are seeking. We only charge if we are able to find a suitable site that you want us to form a location notice on. We ask that the search parameter be narrowed down to within a 5 mile stretch. Should also forewarn you that many of the historic and infamous mining areas that are well known publically are typically areas already claimed out, and we may need to decline a search only as we recognize there are extremely limited chances in finding a suitable open site. Our current fees start at $150 for the first location notice and $75 for any additional within that same search parameter. Fees are subject to change, depending on the volume of requests being processed, and mining season (when we are normally in the field working our own sites), but we will let you know up front what those costs are at the beginning of the process. If you don’t want the hassle of filing the location notice paperwork, that is something that our company can do for you as well, we can discuss the pricing for your specific area. Contact us to get started.